The value of an internship is in exploring career possibilities, developing contacts and extending and obtaining new skills and insights. Our team works throughout the students' first year to direct them toward the best internship given their career interests. Interns have worked all over the world in a wide scope of jobs that transcend their specialties. Graduate students are strongly encouraged to complete a summer internship. Their assignments range across all sectors and take them to nearly every continent across the globe. Whether conducting field analysis to understand binational relations, quantifying market access or participating in development strategies, our students earn early entry to the major entities that shape our planet’s commerce and conduct. They graduate with valuable perspective and the seeds to a professional network that spans the globe. Read a sampling of recent internships organized by regions. 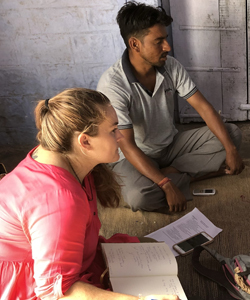 "This summer I worked with a research team at the International Water Management Institute (IWMI) that was evaluating the economic impact of granting farmers access to solar irrigation technology. We worked closely with the Agricultural Transformation Agency (ATA), which forms part of the Ministry of Agriculture of Ethiopia. 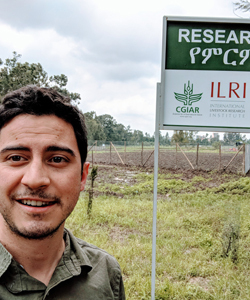 My job was to help collect, clean and analyze data on farmers, as well as to engage with the Ethiopian government and other IWMI partners." 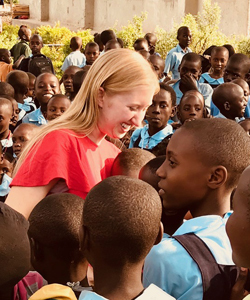 "I interned with Embrace It Africa (EIA), a small nonprofit who supports the small village of Bethlehem through microfinance, healthcare and education. I worked directly with the founders of both EIA and their partner, Bethlehem Parents Primary School, supporting all three prongs of their mission. With business, I met with local business owners and provided consulting and entrepreneurship coaching to improve profitability. With healthcare, I learned how to design a cooperative insurance strategy affordable to groups in the local village. With education, I created a foreign donor focused campaign featuring 56 orphaned students who need sponsorship to continue their education." 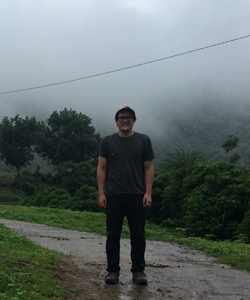 "My internship encompassed work with government, private industry, the press and NGOs. At the U.S. Embassy Malabo in Equatorial Guinea, I was introduced to a wide range of topics stemming from the unique situation of the country, including the discussion of issues of corruption and economic development barriers with representatives from the IMF and United Nations. Attempting to improve the opportunities available to Equatoguineans, I assisted with various social and educational outreach programs supported by the embassy. Furthermore, I was able improve my language abilities with immersion in this uniquely Spanish speaking African country." "I worked at the United Nations Conference on Trade and Development (UNCTAD), the only UN body that deals explicitly with trade and investment issues. As an intern in the Africa section, I worked on one of UNCTAD’s flagship publications, the Economic Development in Africa Report. The 2018 version of the report is focusing on the African Continental Free Trade Agreement, and I did quantitative research on how the agreement should be structured to generate the greatest possible increase in welfare for the continent. I put the skills I learned in the Quantitative Methods series into practice and saw how economic policymaking is done firsthand. 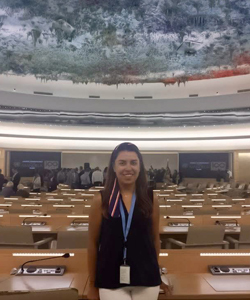 Best of all, I was surrounded by incredibly smart, motivated and idealistic colleagues and in the exciting environment of the Palais des Nations, the U.N.’s headquarters in Geneva." 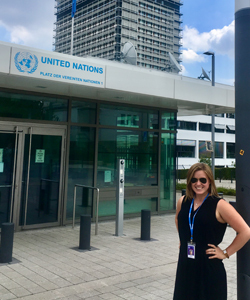 "This summer I interned in the Communication Office of the United Nations Framework Convention on Climate Change (UNFCCC) Secretariat. Working for a tightknit and focused department of 10, I was able to support a variety of strategic communication projects. I wrote rapid response articles from the UNFCCC, managed the UN Climate Change social media platforms, helped to develop multiple strategic messaging initiatives leading up to the Global Climate Action Summit in San Francisco, Calif. and the annual UN Climate Change Conference of Parties (COP 24) in Poland and even researched and drafted a few speeches for Executive Secretary Patricia Espinosa." 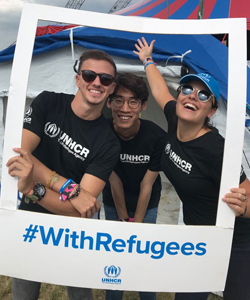 "This summer I interned in the External Relations Unit of the Regional Bureau of Africa at the United Nations High Commissioner for Refugees (UNHCR) headquarters. My first month focused on creating fact sheets and regional reports about refugee situations in Africa for the director in coordination with the field office, as well preparing the annual report for UN Secretary-General. I also managed briefing notes and memos for various meetings, including the European Humanitarian Aid Operations. 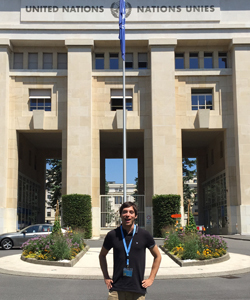 The greatest experience I had was participating at the sixth formal consultation of Global Compact on Refugees at Palais des Nations, where UNHCR and UN member states met to discuss the final draft of the Global Compact on Refugees where I helped compose statement notes and acted as a runner for the delegates." "The Organization for Economic Co-operation and Development (OECD) at the Nuclear Energy Agency is an international institution that issues many valuable research reports for improving world nuclear safety and security. I worked for the Division of Nuclear Technology Development and Economics, which is a division specially focusing on economic aspects of nuclear energy. I worked on two projects – decommissioning cost of nuclear reactors and estimation of nuclear accidents. Under instruction of professional economists, I researched and wrote about the business environment for nuclear energy. During the internship. I had an opportunity to meet other young professionals with various backgrounds. OECD holds events for making connections, so it was easy to meet people." 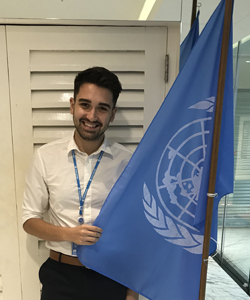 "During my internship at South Centre, I got to see first-hand how developed and developing countries work on policies aimed at achieving sustainable development, including environmental, gender and trade issues. I helped conduct research on clean energy access in the least developed countries, writing policy briefings that were shared with the governments of the South Centre’s 54 developing member countries. I also participated in meetings and official assemblies in the UN Secretariat where Ambassadors of developing countries express their main concerns, interests and strategies to achieve sustainable development. In my internship, I was able to apply on a daily basis the writing and analytical skills I have obtained from my first year at GPS. Moreover, the knowledge I acquired in Professor David Victor’s classes on energy and environmental policy has been essential in effectively conducting my research and produce policy briefings successfully." 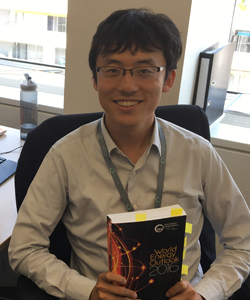 "I studied the Japanese electricity market at International Energy Agency (IEA), a multinational institution focusing on energy issues. Since the market is under fundamental restructuring after the devastating earthquake and nuclear accident, Japan's challenges contain many lessons from which other countries can learn. Thus, my job was to summarize the essence of its challenges for a future report. Skills acquired at GPS were very helpful, for not only deep analysis, but also collaboration with my teammates across the globe. Thanks to this opportunity I can learn how to tackle hard global problems together." 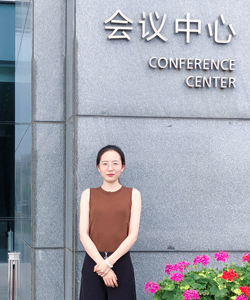 "This summer, I had the opportunity to intern at Taicang Finance Bureau. My duty was to carry out research about talent education and human resources management. In July, I focused on designing more detailed key performance indicators for civil servants and employees who are under probation. I also had the opportunity to watch a poetry recitation contest held by Taicang Government and to learn how to do first aid and how to protect ourselves when doing sports. Additionally, the colleagues were all friendly and lovely. I really enjoyed the internship." 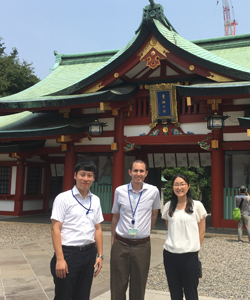 "This summer I interned at Mitsubishi Research Institute (MRI), a think-tank and consulting company within the Mitsubishi Group. My project was to research American and British social impact investment strategies that can be applied to the Japanese market. While I learned a lot about the buy-side of finance, I most enjoyed being immersed in a new work environment and culture. Everyone is so respectful and welcoming – I’d even say it motivates me to be a better person." "Erex is a Japanese energy company specializing in biofuels. The Japanese energy market will be fully deregulating in 2020 and my job was to assist their corporate planning division, researching additional means of revenue from the ancillary energy market. Most of my research was on the UK, since their market is the system that Japan will be most closely emulating. I also got to visit various energy and policy forums hosted all over Tokyo and presented my findings. Some examples include listening in on policy discussions at the Ministry of Economy and Trade, hearing from industry professionals at the UK Embassy and sitting in on strategy and sales meetings with corporate partners." 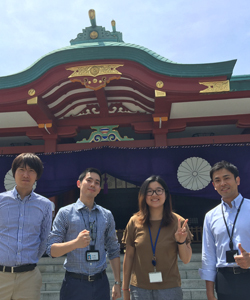 "This summer I interned at the Mitsubishi Research Institute (MRI) in the management and innovation department (MIU1). 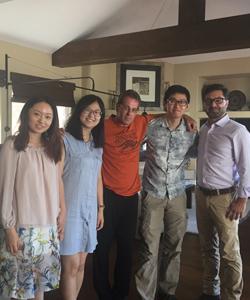 I learned a lot about consulting methods to analyze cases and how to develop business strategy from my colleagues who have various background including healthcare, artificial intelligence, data analytics and so on. My research topic was to compare an industry within U.S., China and Japan. I chose to do my research on e-commerce, with a focus on the fresh food supply chain used in the brick-and-mortar retail stores that big companies recently start to build. The staff were very nice and would take me and the other interns out to lunch and organize fun events." "This summer I worked with the Watershed Organization Trust (WOTR) on a project proposal for a village located in Rajasthan, India. Due to the small-scale nature of the project, my team and I conducted qualitative research methods like informal interviews, focus group discussions and in-depth interviews in order to triangulate unmet needs in the village. The end result was to propose a project that increases villagers’ livelihoods through a crop and livestock diversity program." "The Institute for Philanthropy and Humanitarian Development (IPHD) is a nonprofit organization located in Jodhpur, India. The organization is dedicated to community development and women’s empowerment in the local village of Bhikamkor. The programs that run in Bhikamkor focus on livelihood, education and health. This summer I focused on improving the organizations networking capabilities, drafting a benchmark report of the various programs and developing a needs assessment for Bhikamkor farmers. This needs assessment will assist IPHD in future agriculture development projects." 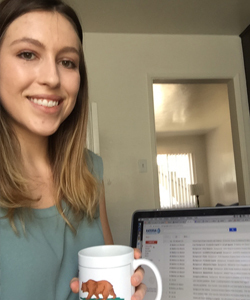 "As a trade intelligence fellow at CNA, I worked on articles which analyze and compare trade partnerships, such as Brazil-China and Mexico-U.S. Some articles I completed are about NAFTA negotiation updates, Brazil’s international place in providing assistance to its agricultural sector and lessons Brazil can learn from Mexico’s trade dependency on the U.S. By the end of the internship I finalized an analysis on Brazil’s trade potential with Mexico and Canada, and an analysis of Brazil’s tariff preferences with other Latin American countries." 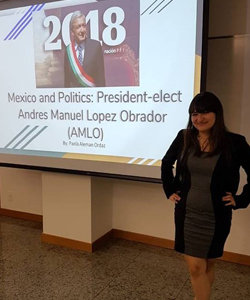 "This summer I carried out a research project on the Mexican government’s public policies toward returned migrants through two interrelated internships. 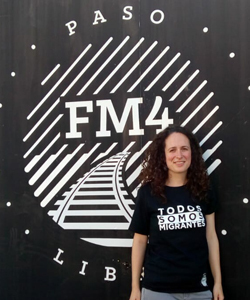 I spent the month of July at FM4 Paso Libre, an NGO in Guadalajara that defends migrant rights through research, programming and operating a migrant shelter. In August and September, I interned at Fundación Idea, a public policy think tank in Mexico City where I conducted interviews with relevant government officials, civil society actors and returned migrants, analyze federal and state-level programs and maped hot-spots of returned migrants. At the end of these internships, using the quantitative and qualitative skills gained at GPS, I will publish a report of my findings with the GPS Center for U.S.-Mexican Studies." 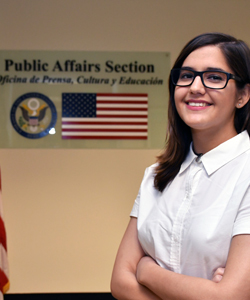 "This summer I interned for the Public Affairs Section (PAS) at the U.S. Embassy Lima, Peru. 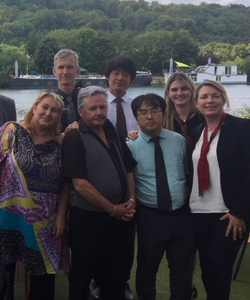 As a member of PAS, I work with the press and media, education and cultural outreach teams. I have been assisting in several public diplomacy projects, including the 4th of July party at the Ambassador’s residence, outreach to underprivileged schools, sports diplomacy and planning a binational art exhibition. I also traveled to Ica, Peru with the educational outreach team and met with college and high school students to speak about educational opportunities available with the assistance of the State Department." "Sawasdee krub! My summer internship was with the Bureau of Diplomatic Security (the law enforcement branch of the U.S. Department of State) at the U.S. Embassy in Bangkok, Thailand. This experience was filled with interesting projects working closely with the Royal Thai Police and the Ministry of Foreign Affairs of the Kingdom of Thailand. I also had the opportunity to assist other offices with matters related to investigations and vetting requirements. 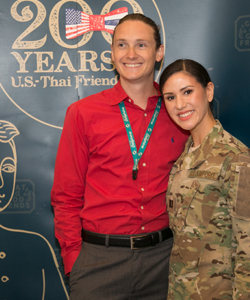 It was an exciting time to be in Bangkok with the celebration of 200 years of U.S. -Thai friendship!" "The Asia Foundation in Philippines promotes better governance, strengthening the rule of law and developing peace and stability in Mindanao. As a programs intern, I worked on peace and stability programs in Mindanao, including business development strategies for the Books for Asia program as well as conducting research for their women’s program. Newly gained quantitative and qualitative skills learned through the rigorous GPS program helped me work efficiently and think about complicated issues deeply and broadly. 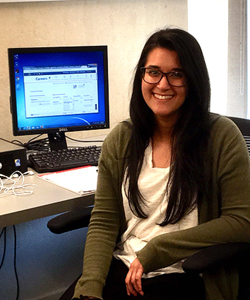 The internship was a great opportunity to work in project management and program design. Finally, Manila is one of the best place to feel the dynamic change in Southeast Asia." 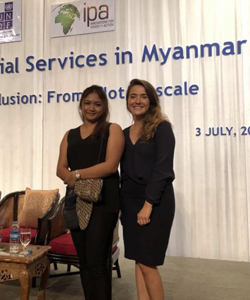 "As a research associate for Innovations for Poverty Action (IPA), my main responsibility was to create potential pricing strategies for an electronic medical record keeping (EMR) software to be implemented across private health clinics and public hospitals in Myanmar. We worked with the first health tech company in Myanmar, Koe Koe Tech, to establish the first EMR Randomized Control Trial to be carried out in a developing country. As we were in the pilot stages, my responsibility was to prep for the RCT and national rollout. I was also responsible for creating literature reviews on other recorded attempts to implement EMR systems in developing countries, creating and implementing surveys for collecting data from hospitals/clinics as well as analyzing said data." 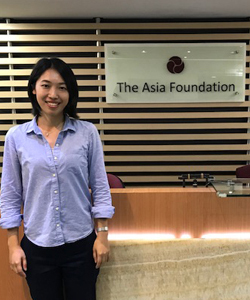 "As an intern with the Being LGBTI in Asia (BLIA) Programme at the UNDP Bangkok Regional Hub, I used monitoring and evaluation techniques to measure program efficiency and ensure that people of different sexual orientations, gender identities and gender expressions are evenly represented. LGBTI populations remain significantly marginalized throughout the Asia Pacific region and BLIA works with community organizations, activists, lawmakers, healthcare providers and government officials to reduce social inequalities for LGBTI people. I worked on developing a set of indicators to measure program efficiency and compiled briefs on the regional progress of transgender rights, LGBTI-friendly laws and strengthening civil society." "The Organization of American States (OAS) Department Against Transnational Organized Crime (DTOC) seeks to strengthen public policy and State capacity in the Americas to confront the diverse manifestations of transnational organized crime, such as drug trafficking, trafficking in persons and migrant trafficking. As a policy research intern, I had the opportunity to use my quantitative skills to provide factual analysis about migrant trafficking and current policy in Central America’s Northern Triangle. 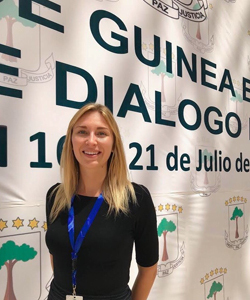 This experience has strengthened my desire to keep working towards a better understanding of migration politics and displacement." Bureau of International Narcotics and Law Enforcement Affairs, U.S. Department of State, Washington, D.C.
"This summer I worked with the U.S. Department of State's Bureau of International Narcotics and Law Enforcement Affairs (INL). Most of the work INL does involves strengthening the law enforcement and justice systems of other countries. Within INL, I worked with their budget formulation team, which requests and defends the billion-dollar budget appropriated by Congress to meet the bureau's strategic objectives. This allowed me to get a grasp of what the bureau does around the world and see firsthand which regions are prioritized based on the level of instability." Office of Maritime Southeast Asia, U.S. Department of State, Washington, D.C.
"This summer I interned at the U.S. Department of State in the Office of Maritime Southeast Asia. My primary responsibilities included assisting the desk officers who cover the six countries in our region, organizing meetings for visiting government officials and creating morning and end of day reports for both bureaus and embassies abroad. 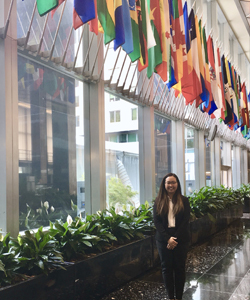 This internship was a great opportunity to experience what foreign service officers do every day and network with fellow interns and professionals from various bureaus and offices." 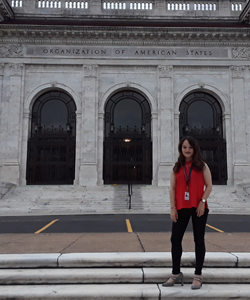 Office of Western Hemisphere, U.S. Department of the Treasury , Washington, D.C.
"This summer I interned at the Office of the Western Hemisphere in the U.S. Department of Treasury and it taught me a lot about how U.S. international economic policy is made. I was able to support the office in better understanding the needs of our western hemisphere neighbors by gathering data on Latin American currency market intervention and the role of the energy sector in state finance. I also learned a great deal about the policymaking process and the coordination efforts required by participating in meetings with staff from the State Department, International Monetary Fund, World Bank and others all focused on the goal of improving U.S. policy towards the region." 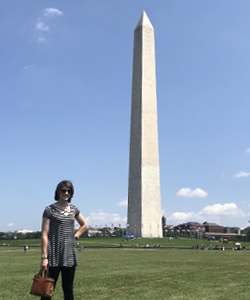 Institute for Local Self-Reliance, Washington, D.C.
"This summer, I worked as an intern at the Institute for Local Self-Reliance (ILSR) to analyze the impact of China's ban on imports of waste on U.S. cities’ policy and markets. At ILSR, I was able to participate in weekly meetings with offices located in Minneapolis and Portland to capture recycling data and status in cities across the U.S. and to use Excel for cost-benefit analysis. In addition, I visited the ILSR-assisted local construction debris reusing plant and participated in a meeting at Baltimore City Hall on improving the recovery of municipal waste." 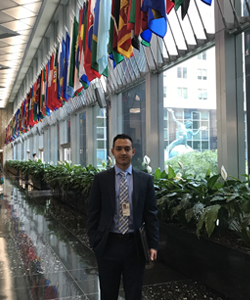 Economic Commission for Latin America & the Caribbean, United Nations, Washington, D.C.
"Being the Economic Affairs intern at United Nations Economic Commission for Latin America & the Caribbean (ECLAC) in Washington, D.C. was awesome. Everyone here comes from Latin America, speaking mostly Spanish, which allowed me to utilize Spanish and learn Portuguese in a professional, immersive setting. 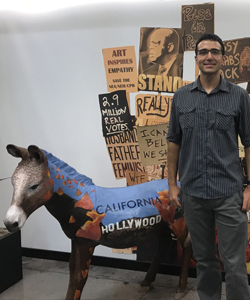 I was able to build on my previous experience as legislative staff in the California state legislature to work on specific projects for the office, such as California's climate and health policy through a Latin American, foreign policy and economic impact lens. I also represented the office at different conferences and briefings and conducted economic analysis, which included drafting reports and analyzing data in order to help complete publications, such as one on income distribution in Latin America. The office has balanced the qualitative and quantitative workload which has allowed me to utilize the tools offered at GPS." 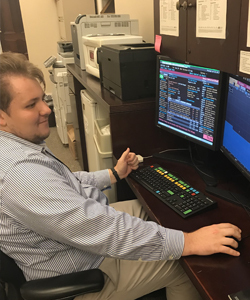 Committee on Financial Services—Minority Staff, U.S. House of Representatives, Washington, D.C.
"This internship gave me the opportunity to see a small slice of the policymaking process in action. As an intern with the minority staff of the Committee on Financial Services, I was able to assist policy staff in helping shape the legislative direction of the committee. From helping with memos and preparing for hearings to doing policy research and helping with markups, it was an incredible experience to see the leaders of our nation make policy in front of my eyes." 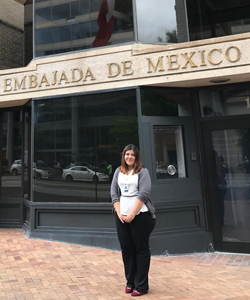 Office of Migration and Hispanic Affairs, Embassy of Mexico in the U.S., Washington D.C.
"My team focused on the issues affecting Mexicans living in the U.S. By using diplomatic and lawmaking tools, the Embassy can protect the lives and dignity of those affected by changing immigration laws. I followed key social media accounts of government agencies, pro and anti-immigrant organizations from both countries and any legislative change to write internal reports in both English and Spanish. I have helped with key administrative tasks, drafted letters for Ohtli award, sought consular support and have attended meetings with ambassadors and civil organizations to determine subsequent actions to take." "I interned as the assistant to American Enterprise Institute’s (AEI’s) political economy chair Nicholas Eberstadt, who is a demographer and North Korea expert. All the effort that I put into figuring out every Stata command was valued and appreciated when dealing with much larger and more complex databases. Memos can be a big challenge, especially for non-native speakers like me, but the intensive training that I got from GPS certainly made me more confident at AEI. More importantly, GPS helped me develop my interpersonal skills, making work enjoyable." California Democratic Party, Sacramento, Calif.
"The California Democratic Party supports democrat candidates across California. My internship involved researching ballot propositions, phone banking, reviewing bylaws and a fair amount of clerical work. Several interns were invited to attend the party convention. I learned a lot about how the party functions. Living in Sacramento was wonderful, including hiking all over the place from Lake Tahoe to Yosemite." "This summer I worked with the San-Diego based nonprofit Katerva, which manages an awards program for sustainable innovation. As a nonprofit and a largely volunteer driven organization, my role covered a variety of activities but was primarily focused on the marketing, media, communication and outreach aspects of Katerva’s work. The projects I was involved with included conducting interviews with the 2018 winners of Katerva’s awards program, developing an annual media plan and researching and creating marketing content. It was very interesting to speak to people involved in such a wide variety of sustainability innovations and encouraging to learn about work being done all over the world to address key issue areas." Ocean Connectors, San Diego, Calif.
"Ocean Connectors is a nonprofit that provides conservation-based marine educational programs to underserved youth in the San Diego area. Given the unreliability of grant writing and funding, Ocean Connectors has developed the “Eco Tours” social enterprise to serve as a secure source of revenue to support and grow its nonprofit initiatives. 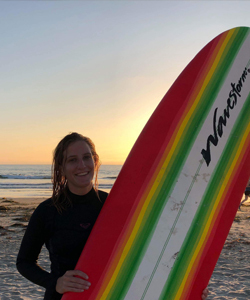 Each Eco Tour offers the public the opportunity to explore San Diego’s scenic coastal areas with experienced guides trained in marine science and conservation education. 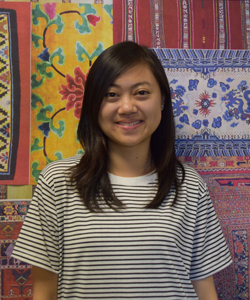 As an intern, I assisted in the research and design of a business plan that will inform the Eco Tour marketing strategy, product and services development and financial plan over the next five years." Swapsy Inc. and San Diego Regional Chamber of Commerce, San Diego, Calif.
"I was the marketing and social media intern for a start-up called Swapsy. I maintained the company’s social media accounts and assisted in writing articles and blog posts for better SEO results. 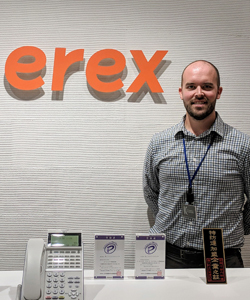 Through researching technology’s impact on expat banking habits in both the U.S. and China, I was able to assist the company in increasing the daily number of users signing up to use their currency exchange services. 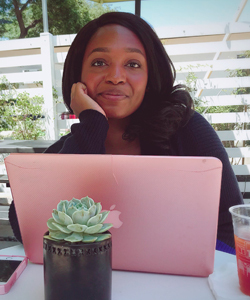 Later in the summer, I joined the San Diego Regional Chamber of Commerce as a public policy intern working in the Department of International Business Affairs." The Refugee Health Unit, Center for Community Health, UC San Diego School of Medicine, San Diego, Calif.
"The Refugee Health Unit works to help refugees overcome health inequalities and preserve the hope they brought with them to their new home. To achieve these goals, the unit works closely with local ethnic community-based organizations to carry out programs that are meant to promote the rights and well-being of the refugee population in San Diego. I found the knowledge I acquired from GPS’ program design and evaluation course were extremely valuable, because this internship required a wide range of knowledge from the course. For instance, my major duties encompassed conducting pre- and post-event assessments, impact evaluation, interviews and designing surveys for needs assessments’ purpose. I also worked on a project to investigate the cause of economic inequality and explored economic opportunities for refugee women and girls in the region." LA Conservation Corps, Los Angeles, Calif.
"This summer I worked for a nonprofit in Los Angeles called the LA Conservation Corps. The Corps’ mission is to provide at-risk youth and young adults with job skills training, work experience and education in order to succeed by working on conservation and service projects throughout the City of Los Angeles. My role was as a research analyst, working on a number of research projects including compiling resources on a housing, food access, healthcare, etc. for case managers and my own independent research project." "I worked as an employment specialist intern in the International Rescue Committee (IRC) in Salt Lake City. The IRC helps people whose lives and livelihoods are shattered by conflict and disaster to survive, recover and gain control of their future. 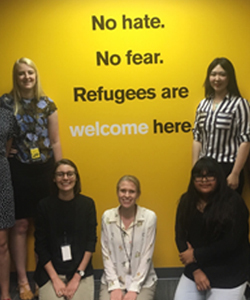 I worked in the employment team with GPS alumnus Nolan La Barge, helping the refugees in the matching grant program find a job and help them become self-sufficient. The internship gives me a chance to meet people from many countries like Congo, Kenya, Afghanistan, North Korean, Myanmar, Vietnam, etc. We can talk to them, know them and help them, which is really an amazing experience." 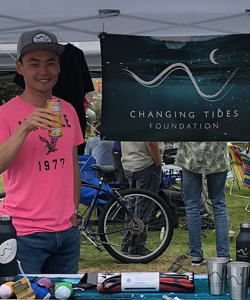 Changing Tides Foundation, San Diego, Calif.
"My internship was working for a local nonprofit in Encinitas, which is dedicated to raising awareness of plastic pollution in the ocean and gender disparity. They have multiple global projects launched with local organizations in Sri Lanka, Ecuador and Panama and activities like free giveaways and donation campaigns every now and then. Most of my job involved collecting the raw data of campaign participants on social media – usually on Instagram – and helping my employer search for online fundraising platforms and grants for nonprofit startups. This internship allowed me to hone my Excel skills and STATA knowledge on resampling the data of giveaway participants in order to select a winner of the prize. Besides those jobs, I also helped my employers run sales online and offline and write blogs on their website."